Seri Resort is designed as a destination resort complete with a stunning bamboo yoga and wellness centre where regular classes are complimented by retreat packages. The restaurant offers absolute beach front with an international menu that includes fresh, healthy options that will satisfy the most discerning diners. With a beachfront pool, guests are encouraged to make themselves at home. Enjoy the breeze and the views. Enjoy casual entertaining on the bottom deck. Upstairs offers a more formal approach to dining and on the top level a charming rooftop lounge invites guests to enjoy before or after dinner cocktails. White sands, turquoise bays, serene beach life and coral gardens, Seri Resort on Lombok's paradise island, Gili Meno, offers all this and more. If your idea of a great holiday is checking in and logging out, then you're in the right place. If you are looking for white sheets and romantic sheers; rooms that open to sea breezes and island views; if your idea of sophisticated dining is a freshly caught fish and seafood grilled to perfection; if you want to watch the sun rise from behind one volcano and set behind another, you're in the right place. 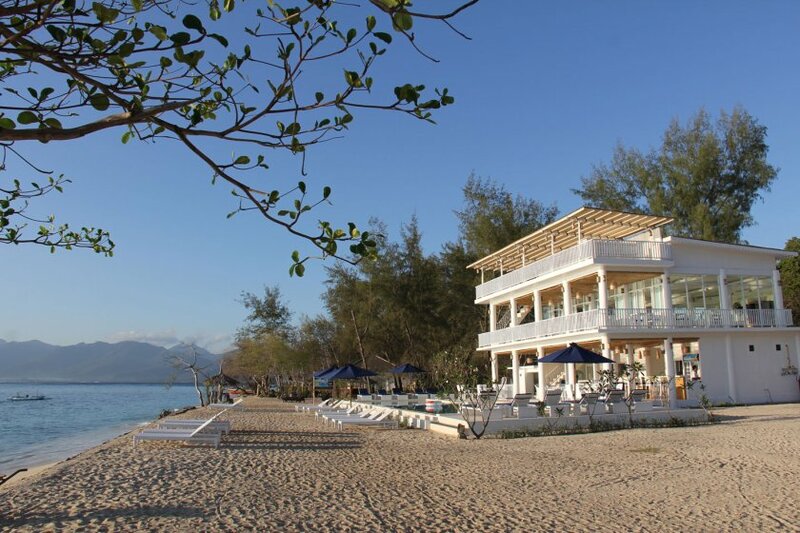 Seri Resort, Gili Meno offers simple sophistication on an island where peace is possible. Where the only footsteps in the sand may be yours, where each day dawns on a tropical paradise, where you can swim in turquoise waters and lay on unspoiled beaches. Where your day is filled with good books, fresh food, yoga and long walks, cocktails by the pool and the sound of lapping waves, great music and the laughter of local children. Offering absolute beachfront, Seri Resort is simply paradise. Gili Meno is the island that time forgot. While the Gili islands have seen an explosion of tourism and development, Gili Meno remains unspoiled, beautiful and simply sophisticated. If the urge hits you to explore, we'll take you out on a boat visiting neighbouring islands and yes, we have Wi-Fi, just so you can let your friends know you're in the right place. Stylish accommodation includes 18 one-bedroom spacious beach bungalows with stunning ocean views leading directly out to the white powdery sand, or the palm-fringed gardens. 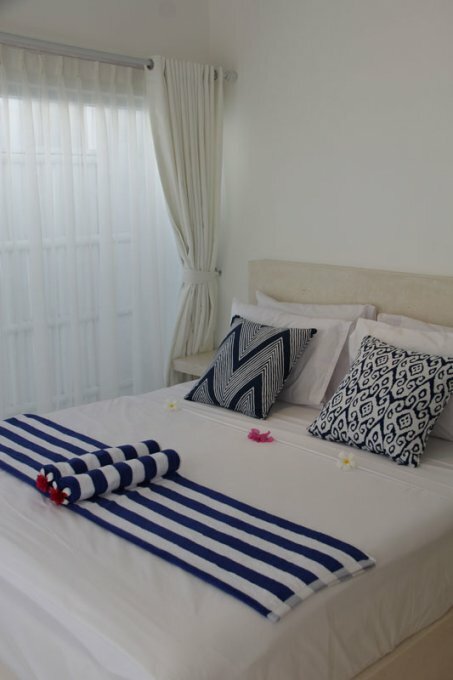 Bedrooms are beautifully decked out with white on white accented with touches of ocean blues, soft white curtains and king-sized beds are dressed with crisp white sheets. Enjoy the natural breeze or sleep in air-conditioned comfort, the choice is yours. 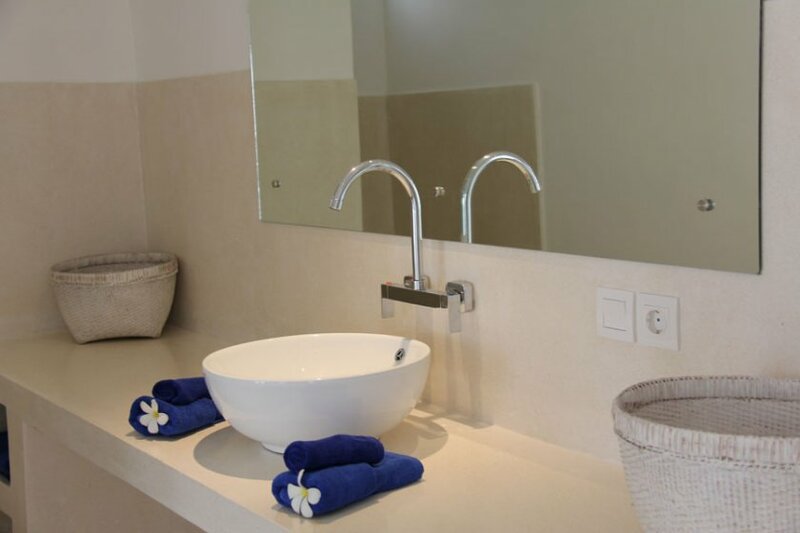 Each bungalow has their own private verandah with plenty of room to relax, en-suite bathrooms with rain showers and toiletries, 32 inch LED TV with Satellite Channels, DVD player, personal safe, telephone, and minibar fridge. The suites are all contained in what we call The Longhouse. A nod to colonial architecture, the two-story long house has white columns and wide verandahs for enjoying the fresh sea breeze and the island views. 16 one -bedroom spacious guest rooms are available with king size or twin beds each with en-suite bathrooms with toiletries, high-tech entertainment systems, personal safe, telephone, and air-conditioning. Robinson Crusoe never had it this good. Perfect for the budget traveller, the beautifully designed 22 bale huts are fan cooled and swathed in romantic mosquito netting they offer the ideal choice for backpackers who want to enjoy resort facilities. They offer comfortable king size beds, a fan, locked up personal closet space, and have immaculate shared bathrooms for men and women. Bamboo blinds come down at night for intimate privacy. payment can be made only by cash and/or TT transfer both in USS (Bank Note) or in Rupiah according Seri Resort bookkeeping rate. Seri Resort GiliMeno mas receive notice of cancellation in writing. No-Show, shorten stay or early the departure charged 100% (total value) from each villa reservation. One Night Deposit payment is non-refundable. Seri Resort GiliMeno must receive notice of cancellation in writing 45 days before arrival for regular season and 65 dats before arrival for high and peak season period to avoid second night charge penalty.